We The Saif Ali Khan Updates team Would like to welcome all the Visitors on our Website,Facebook,Twitter Fanclubs and we are thankful to all of you for supporting us indeed !! There is a screening of Dil Chahta Hai today at Cinemax(Versova) at 12pm to celebrate 10 years since the release of Dil Chahta Hai. Farhan Akhtar will be present for Q&A after the screening. Here are some wonderful moments from the movie. Failures to fame, and from the slide down to tasting success, Saif Ali Khan has come a long way. After being in Bollywood for a long period of time, he was able to give some solo hits in the form of ‘ Hum Tum’ and ‘ Parineeta’, a cool 12 years after the starson debuted on celluloid. More known as Sharmila Tagore and Mansoor Ali Khan Pataudi’s son, Saif’s hits came only in the form of multi- starrers like ‘ Main Khiladi Tu Anari’ and ‘ Dil Chahta Hai’. Although he did win the Filmfare award for best male debut for his film ‘ Aashiq Awara’ ( 1993), the run after that was never so easy for the actor. And Saif still hasn’t forgotten those days. ” Every time I watch my old movies I realise how hard I have worked to reach this position. With high waist jeans and a different haircut, I started a new trend in the industry. And with the emergence of cable networks and satellite rights around the same time, the trend spread like wildfire. Watching them makes me feel that all the success that I am getting today is the result of the hard work of those days. Hindi films have now become a lot more cool and happening with recognition at many levels internationally,” says Saif. This actor had to go through a string of flops just before some hope was sparked with Farhan Akhtar’s youthful movie ‘ Dil Chahta Hai’ in 2001. Speaking about his career graph in Bollywood, Saif says, ” I had started off in the industry on a very bad note. With ‘ Parampara’ and ‘ Aashiq Awara’ being moderately hit, ‘ Yeh Dillagi’ brought in some relief. With gripping music and an amazing love story, it turned out to be my first hit film. Immediately after that came ‘ Main Khiladi Tu Anari’ which was another good film. After this started the worst phase of my life with 17 flop films in a row! And then ‘ Dil Chahta Hai’ happened which changed the trend of Hindi cinema completely. Farhan Akhtar came up with an amazing urban character which was much different compared to the ‘ desi’ version of a hero like Amitabh Bachchan.” And after playing this youthful act Saif Ali Khan was all set to experiment with roles and characters. Saif was open to playing characters even having a negative side… anything that was different appealed to this actor. With films like ‘ Being Cyrus’ and ‘ Omkara’ coming his way, Saif was appreciated for his acting. ” I believe that initially I didn’t have faith in myself. This is wrong and shouldn’t happen because your director has complete faith in you. Whether it is ‘ Langda Tyagi’ of ‘ Omkara’ or even the character of the 10th standard school teacher that I play in ‘ Aarakshan’, I must have complete faith. Similarly I played a Sikh lover boy in ‘ Love Aaj Kal’ while I had never imagined I would play a Sikh character,” says Saif. And once Saifu turned a producer with ‘ Love Aaj Kal’ and the forthcoming ‘ Agent Vinod’, there has been no looking back for him. Perhaps so much hard work and long innings in the industry seems to have taken its toll on the star’s health. No wonder then he was admitted to hospital some time back. But Saif is singing a different tune. ” According to my doctor, my lungs are like those of a non- smoker athlete. In order to stay fit and healthy I have quit smoking two years back. Also I have been doing yoga and following a proper diet because of which I have control over my health. Also I have reduced eating red meat so as to keep my body healthy,” he says. This single father of two seems to have managed his professional and personal life well. Having experienced all the pressure Saif says, ” I have no complaints from my present situation. I make every effort so my children receive all the love and attention from me. I believe being a father one needs to create a strong connection with kids. I like talking for long and having fun with Sara and Ibrahim.” As his face lights up talking about his kids, we don’t interrupt. ” The birth of Sara and Ibrahim was the ultimate moment of happiness for me. Happiness comes out naturally the moment one takes their small child in their lap. And the best part is that when they grow up, your values reflect in their behaviour. I believe, creating a strong bond with our children is extremely important,” he says without holding back. Saif Ali Khan made his debut with Aamir Khan. They first starred together in Parampara (1993). The second movie they worked together was Dil Chahta Hai (2001) – often regarded as the game changer movie in Bollywood. Parampara was directed by Yash Chopra. Aamir and Saif Ali Khan played Ranbir (Aamir Khan) and Pratap (Saif Ali Khan), half-brothers who are separated because of a family feud. Ranbir and Pratap had the same father, but he has been killed in the family fight. Ranbir is brought by his maternal grandfather, while Pratap is brought up by his mother and paternal grandfather. The two young men join college and become close friends. They do not know their relationship with each other. The movie traces their discovery of their past. The movie did badly and the two did not work together for nearly a decade. 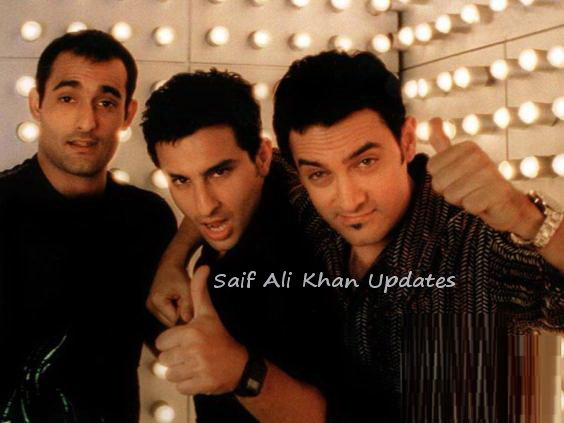 If their first movie together flopped, their second movie together, Dil Chahta Hai was a critical and commercial success. Directed by debutant Farhan Akhtar, it was one of the first Hindi movies that showcased the life of Gen X. The movie looked at the lifestyles and aspirations of the young in India. Aamir Khan played the role of Akash while Saif Ali Khan was Sameer. The two along with Siddharth (Akshaye Khanna) are fast friends and college mates. All of them have different dreams and ambitions. Aamir Khan and Saif Ali Khan were excellent in the movie. Then: Saif entered the industry in the 90s with a lot of hype. After all, he was Mansoor Ali Khan Pataudi and Sharmila Tagore’s son. But despite being signed by good banners, his early movies were disappointing. His styling was weak, his voice was unimpressive and he couldn’t dance. He was careless about his appearance and seemed to be insincere towards work. Now: Saif’s fortunes changed with Farhan Akhtar’s Dil Chahta Hai (DCH). Saif had a makeover – a new hairstyle, a leaner and fitter body and, overall, a cool new look. DCH was followed by films like Ek Hasina Thi, Kal Ho Na Ho and Hum Tum which reiterated his ‘urban cool’ appeal. He started taking care of his looks and health. A few years ago, when he was admitted to hospital because of chest pain, he even gave up smoking. Now, he gyms and practises yoga regularly. “I’d like to believe I am looking good and I am not being vain. For what it’s worth, I wasn’t born with a face that has ‘hero’ written all over it. At times, people have even called me a ‘funny-looking guy’. It’s taken a lot of effort to look like the typical hero; a man the youth can identify with,” he says.